Cinemagram animates your photography and brings a fresh perspective to the increasing number of iPhone apps blending photography and video. If you use Instagram, then you’ll find yourself navigating the Cinemagram interface in a snap. It is virtually a mirror image. The default view is the popular news feed. With a touch on the “latest” icon, you can check out the most recent uploads. To make a Cinemagr.am animated photo, you press “capture.” Your album and account settings are also just one touch away. There are just three simple steps to create an animated photo with the Cinemagram iPhone app. First, you must take a short video of 2-3 seconds. A short video with movement is much harder than it seems. You can define a usable portion with a responsive slide function. Unfortunately, you cannot upload videos from your iPhone library. This would be a tremendous addition to the functionality. I have a video of my son with his Lego robot that would be incredible with the application of the Cinemagram magic. The next step is to “draw mask.” You use gestures to choose the animated area. You pinch to zoom in, then you color with your finger. Precise and agile gestures will lead to better results in your final product. The last step is photo effect application. There are five choices including vintage, black and white, and dramatic light effects to bring the video depth. The texture and perspective blends the animated area with the still photograph. The appearance has a seamless quality. It’s trompe l’oeil for the 21st century. The addition of the effects is a huge element of Cinemagram’s success. After you have completed your animated photo, you have several options for sharing. Using simple on and off slides, you can share with Cinemagram, Tumblr, Facebook, and Twitter. Once completed and in your feed, you can share via email with successful integration of your iPhone’s contacts. One of the neat features of Cinemagram is the ability to create animated photos without creating an account and sharing with the Cinemagr.am social networking community. There are users who like to create interesting photos, videos, collages, and montages, but they don’t want to take the time to register or participate in the social engagement aspect of an iPhone app. 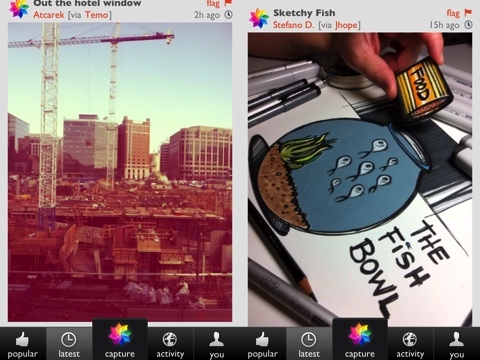 Cinemagram’s iPhone app takes a complex process and distills it. Animated photography becomes more refined, user-friendly, and exciting with Cinemagram. It is worth the $1.99 download price from the App Store, and it will be worth five stars with the additional use of video from your library. Update: The Cinemagram app has gone free for now and we are not sure how long this price drop will stay in effect, so be sure to download it soon. 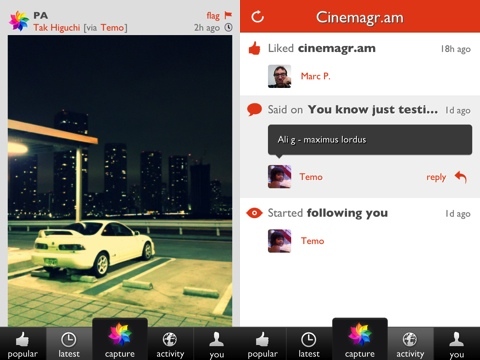 AppSafari review of Cinemagram was written by Jenni Ward on March 12th, 2012 and categorized under App Store, Fun, Photos, Utilities. Page viewed 6211 times, 1 so far today. Need help on using these apps? Please read the Help Page. Great review! We love the way you describe the steps to creating a Cinemagram.
? You can now follow your friends to see what they are creating and liking. Fantastic news! Thanks for the update.